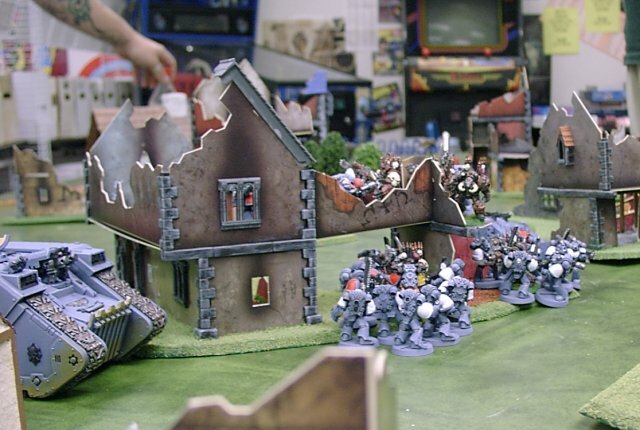 On the first Saturday of every month, there is a 40K tournament at Fantasy and Sci-fi Games (formerly Generation X) on Marsh Lane in Carrollton, Texas. 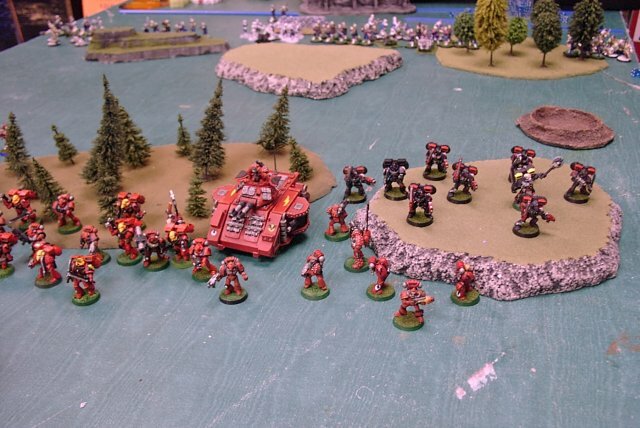 While I had played there several times in the distant past, I had never been to the tournament before, and I was eager to see how my Blood Angels would fair against their cheesy tournament-winning armies. It was quite a delight! 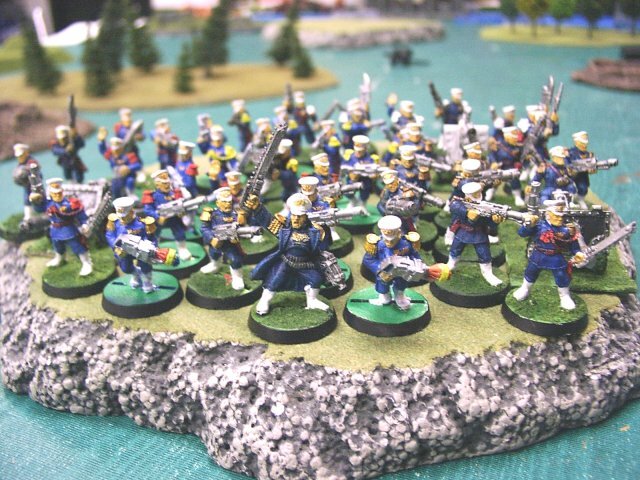 The players there were reasonable, and instead of cheesy steam-rolling armies, I found that every opponent I played against had a very balanced army - the kind that score high for selection at GW tournaments, you might say. So each game was 1500 points, no special characters, etc., etc., scored in the manner typical for GWUS grand tournaments. We rolled on the advanced mission selction table, and played for about two or two-and-a-half hours per game or until the game was over. Rich, the Dark Eldar player, came out on top with 47 points. I came in close second with 42; and I was very pleased that I was granted second place in painting. 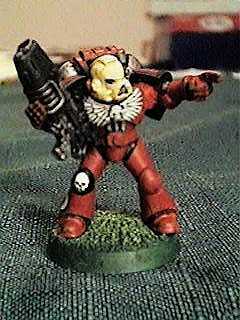 Chaplain Gregor - equipped with jump pack, bolt pistol, frag grenades, melta bombs and the usual crozius arcanum and rosarius. 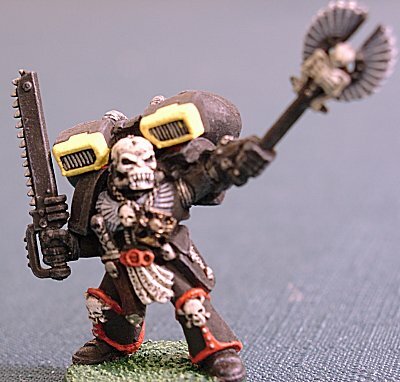 Death Company (variable size) - equipped with jump packs and usual array of close combat weapons. 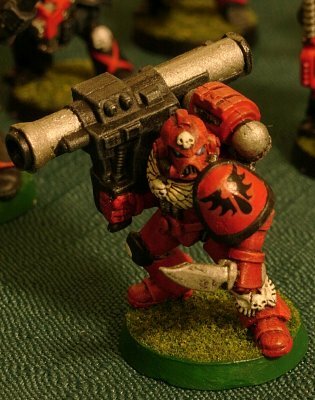 All Death Company also have frag grenades. 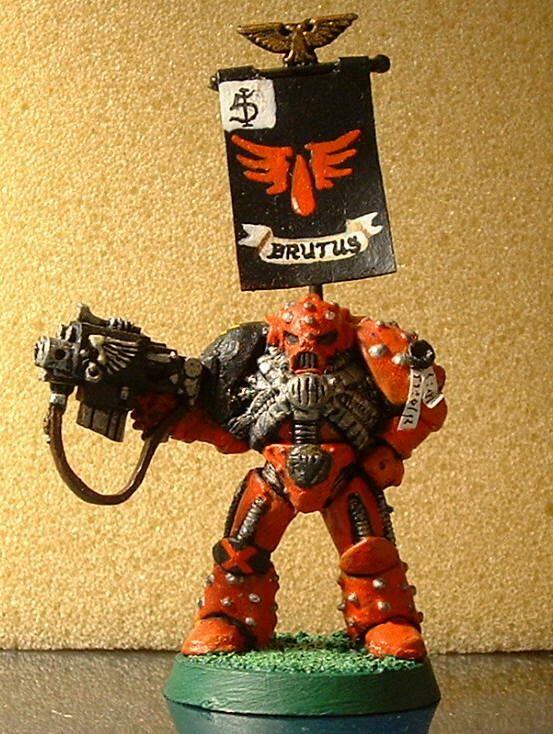 Tactical Squad Brutus (10 models) - lead by Veteran Brother-Sergeant Brutus, who carries a storm bolter and purity seals. The squad has a plasma gun and a lascannon. 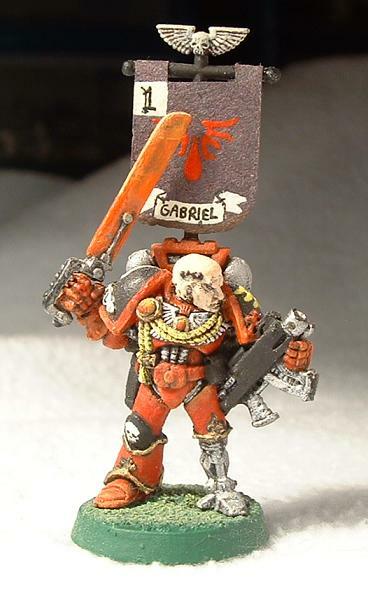 Tactical Squad Gabriel (10 models) - lead by Veteran Brother-Sergeant Gabriel, who carries a bolter, meltabombs, and a power sword. The squad has a plasma gun and a missile launcher. 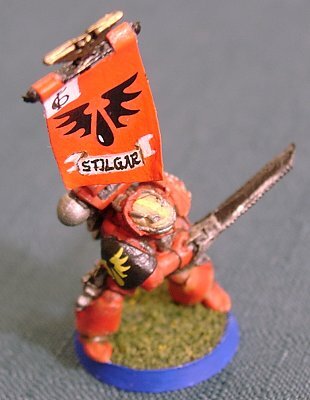 Tactical Squad Stilgar (10 models) - lead by Brother-Sergeant Stilgar, who is armed with a bolt pistol and chainsword. 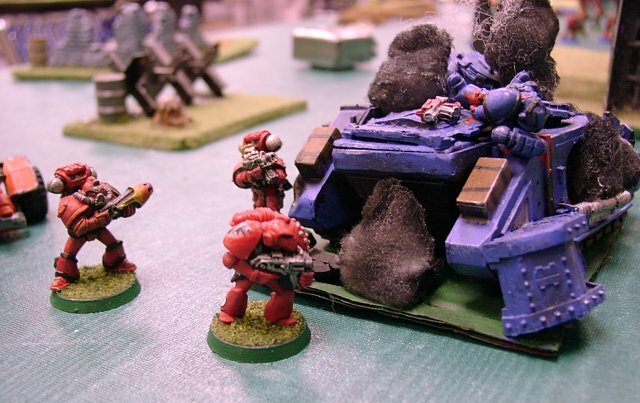 The squad has a flamer and a heavy bolter and is equipped with frag grenades. 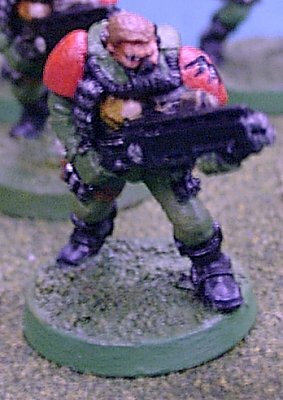 Scout Squad Lister (6 models) - includes shotguns, bolt pistols and swords, as well as frag grenades. Attack Bike Squadron (2 models) - equipped with heavy bolters. 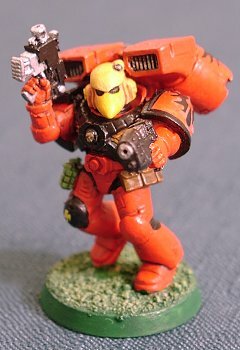 Assault Squad Adorno (10 models) - one brother carries a plasma pistol. 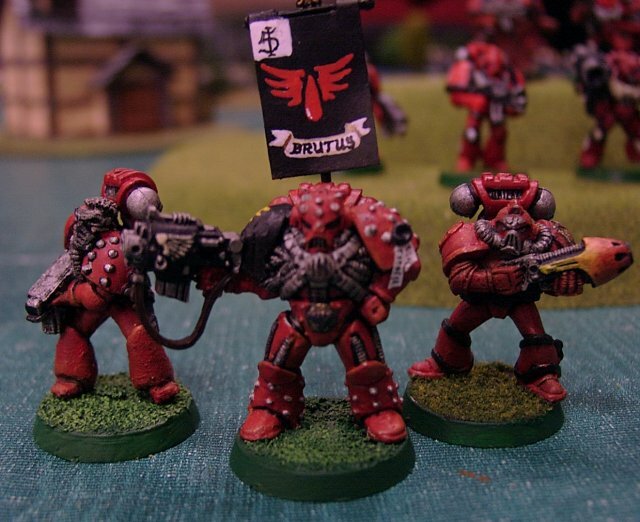 All the other models are armed with bolt pistols and close combat weapons. In addition, the squad has been issued frag grenades and meltabombs. 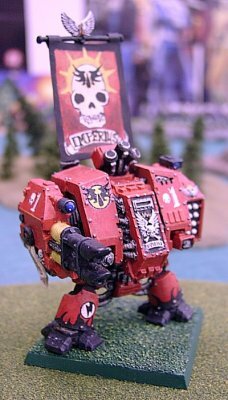 Dreadnought Imperius - carrying an assault cannon and power fist with a built-in storm bolter. Imperius also sports a smoke launcher. 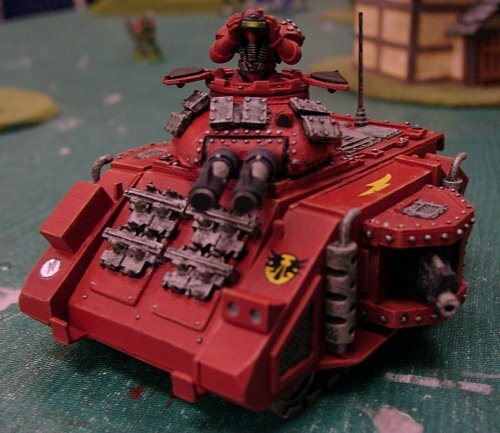 Predator Annihilator - twin lascannons in the turret with heavy bolter sponsons, extra armour, and smoke launchers. IIRC, there were over 150 men in his army - luckily, though, I didn't have to face any tanks. Because of my high strategy rating, I was able to choose to be the attacker; although I have to wonder what it would have been like to be the defender in this game. Despite taking heavy losses due to the clever use of plasma and melta weapons by my opponent, I managed to all but vaporize the entire Guard contingent on one side of the board and squeeze five units off for a victory in the sixth and final turn. My second opponent was the infamous Bill Zalman. 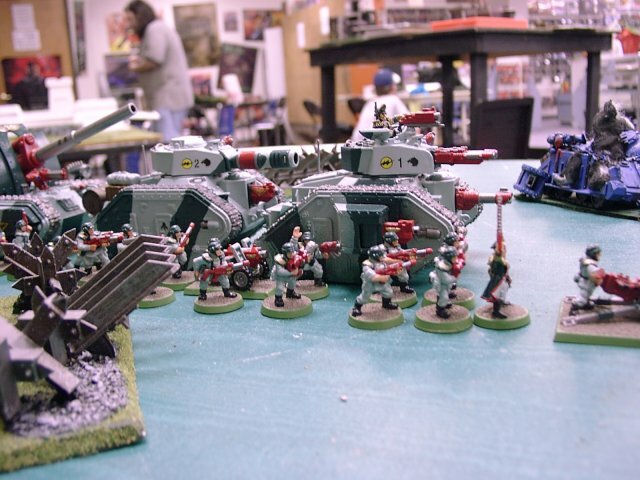 A veteran of the Chicago Grand tournament, Bill's Imperial Guard were easily the most spectacular miniatures present that day. 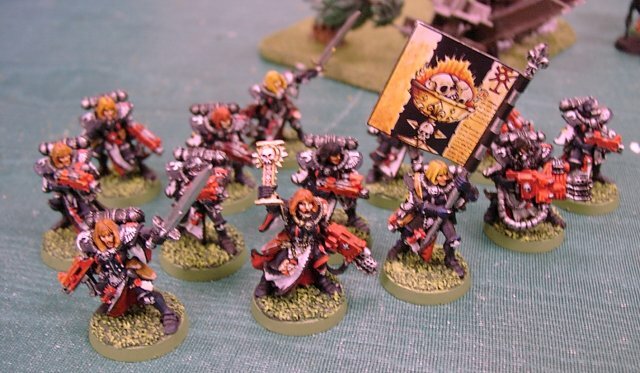 I don't think there was any question that his army was the best looking, and indeed, he won first for "Best Painted." The mission was a standard "Cleanse" operation, and he pinned me far back in my corner by placing one of his Chimeras near the center of the board. I got a little nervous when I saw the Sentinel squadron, but Bill assured me that due to their weak armour, they seldom last past turn 2. 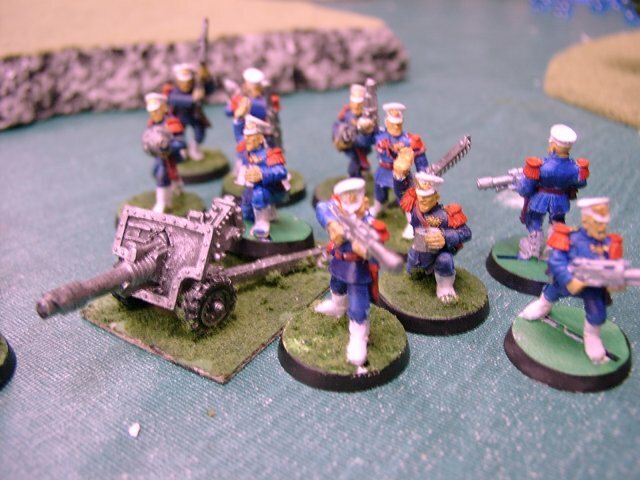 Despite taking some frightening losses (including five members of Squad Brutus to a demolition charge! ), I was able to push all of his units out of my deployment zone and contest the other three quarters of the board for a narrow victory. 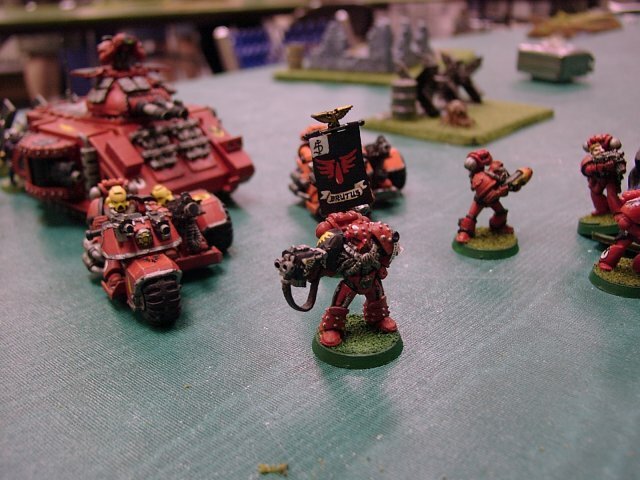 My third opponent, Mike (shown here in deep meditation prior to our game), had a large Sisters of Battle army. 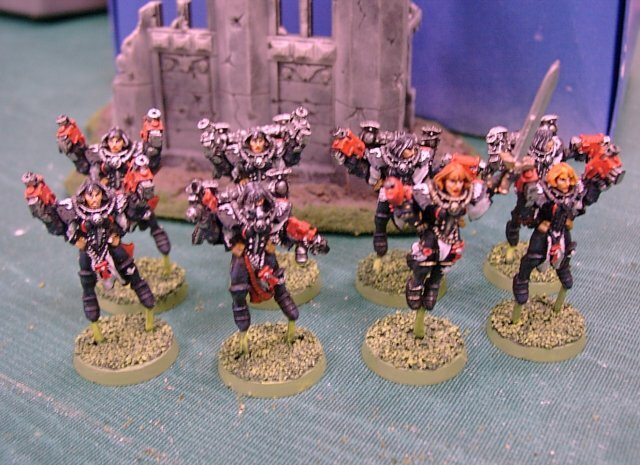 Mike's Sisters were wonderfully painted; the only thing that kept him from competing as a painter was that only a few of the models in the game that day had been completed. The mission was "Rescue", and after placing all six objective tiles, we deployed our troops on the board, positioned in a race to retrieve them. 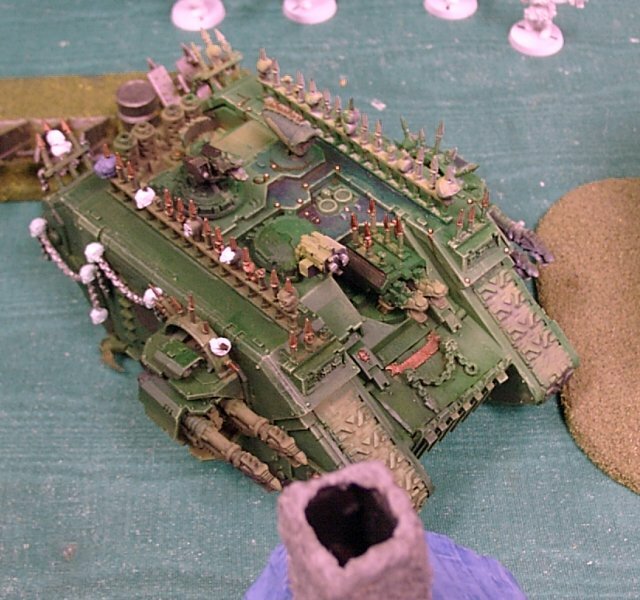 The Land Raiders were out in force that day, much to the delight of Rich, the Dark Eldar Player, who no doubt had fun vaporizing them with his Disintegrators and Dark Lances.